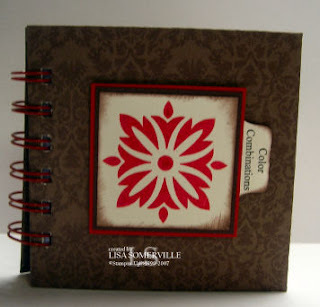 I recently came across a thread on SCS that talked about using your Bind It All and card stock to make a Color Combination Book. 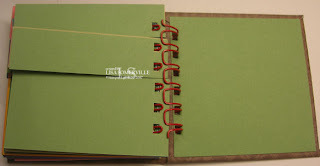 Jan Tink had one she made last year using the rollabind - she said she took it apart and redid hers with the Bind It All - you can see hers on her blog. I made mine a little differently - I used coasters for my front and back covers and covered them with the Baroque Background Designer Series paper. 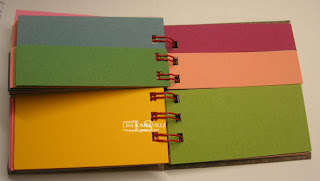 Open View - note how the pages flip, so your book becomes interactive - great for picking out your color combinations! Hey, that was my thread! AND THANK YOU So much for trying it. I was chicken to cut the cardstock for the coaster size like my upline, Jenn (jbalcer) suggested. I'm glad you did it first ;). Seriously, LOVE IT. I can't thank you enough! This is very cool! I just got a Bind-It-All. . I might have to try this book with it! what a great idea!!! I can't wait to make one.